PED is simultaneously a pseudo service bureau and an info/excer-tainment outlet from which viewer/participants may embark on free, talking-bicycle lecture tours. Each site-specific instance of PED provides many different thematic tours, each with a specific route to follow. 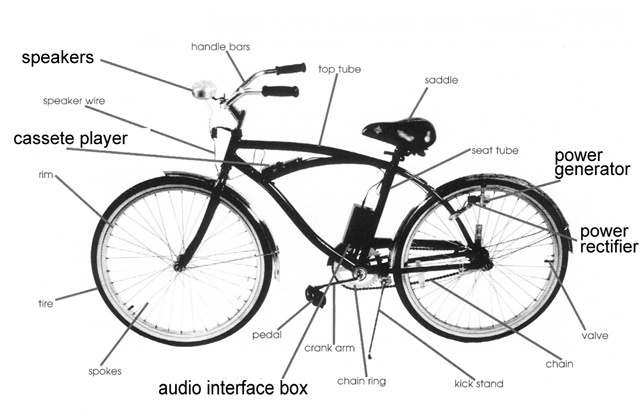 Each bicycle is outfitted with a pedal-activated audio system. As the viewers pedal they hear the lecture, and when they stop the lecture ceases. 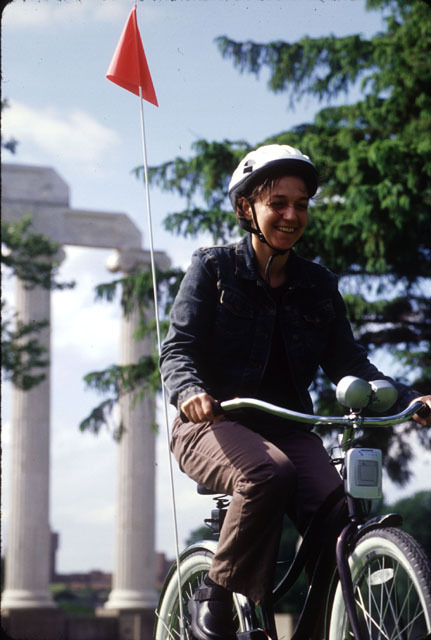 Each 'lecture' is heard via small speakers mounted to the handlebars of each bicycle. Each tour begins and returns to the PED service bureau. Each route is marked with either temporary chalk-based paint or, alternatively, signage. PED service-bureau attendants 'perform' 8 hour days--encouraging participants, suggesting routes, maintaining bicycles and keeping records. 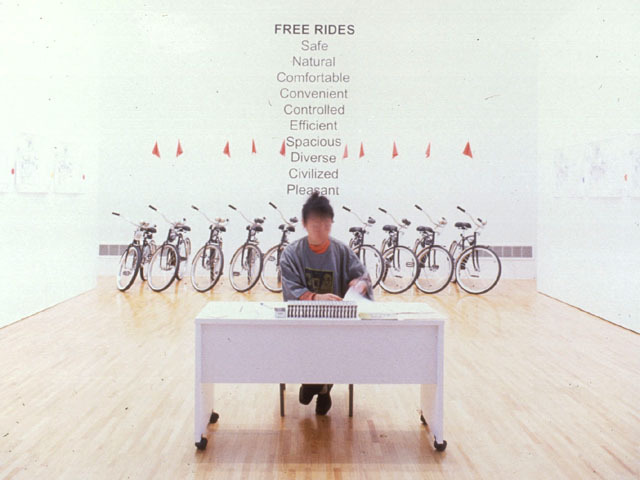 PED expands the parameters of performance by both invisibly performing a service bureau and orchestrating viewers to unwittingly perform (as they conspicuously ride through the city or locale on the talking-bicycles, adorned with identifying helmets). 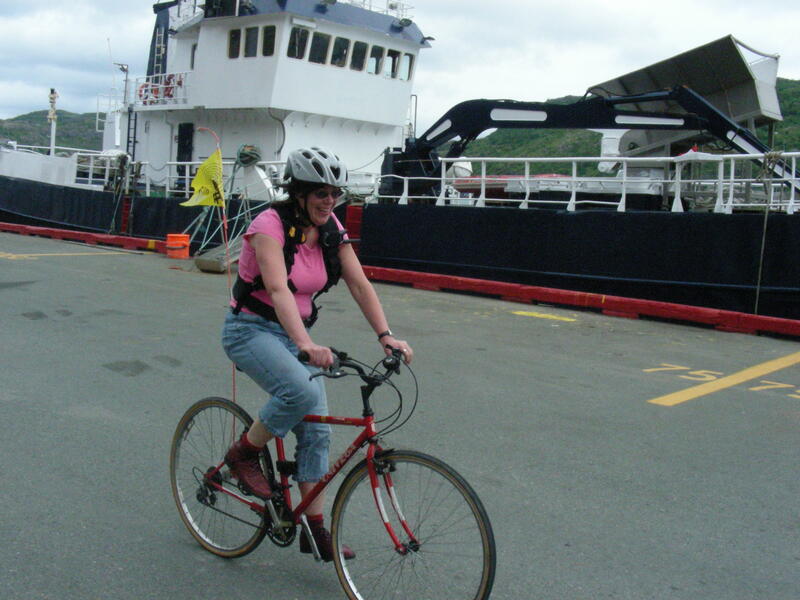 Tours typically range in length from 5 to 20 minutes, and cover a correspondingly sized area of the city/locale. PED.Buffalo (April-July, 2001) was the first instance of the more embracing PED project and included ten tours: Safe, Natural, Comfortable, Convenient, Controlled, Efficient, Spacious, Diverse, Civilized and Pleasant. PED.Buffalo took place at the University of Buffalo Art Gallery and explored pedagogical issues of guidance and control. It posed and answered questions concerning the relationship between the suburban university and the decaying rust-belt city of Buffalo as participants traversed bike paths running throughout the 1200-acre campus, each tour with a different theme based on familiar adjectives used in marketing suburban property. The lectures varied in nature from the professorial to the sensorial, from the informational to the irrational, and periodically disseminated details related to the passing terrain--former wetlands that were paved over to build the campus. 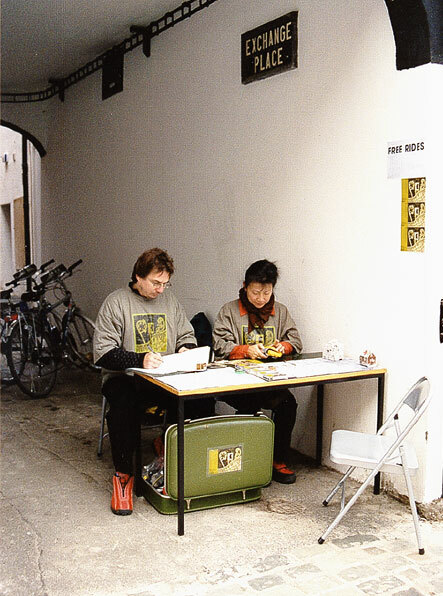 PED.Belfast (December, 2002) included two tours: Economy and Business/First each embarking from a temporary PED service bureau, in an alleyway adjacent to the Catalyst Art Center. The content of the PED.Belfast lecture tours was a recontextualization of the city's projected image contrasted with its quotidian activities. Much of the marketing of a city depends on creating a pre-digested, unified image and reifying stereotypes (albeit for ostensibly diverse temperaments). Conversely, PED.Belfast explored diverse subjective vantages within the living city through an analysis of what should be seen/hidden, experienced/forbidden, known/forgotten, celebrated/mourned. PED.Belfast's tours were narrated by twelve Buffalonians in Irish taverns who had never been to Ireland along with twelve Belfastians in Northern Irish taverns who had never been to the states. 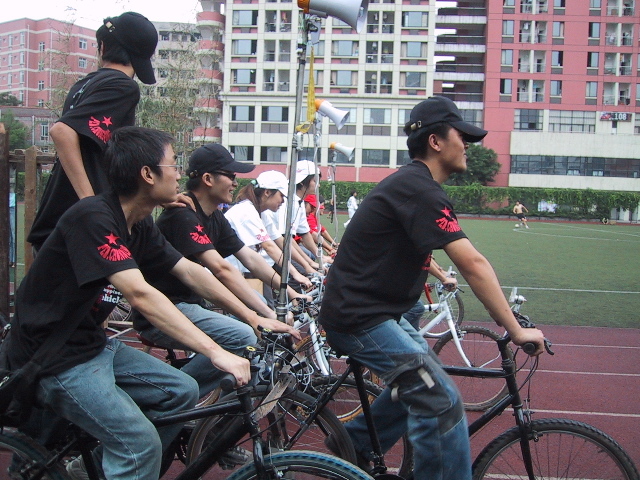 PED.Chongqing (June 2006, Chongqing, China) In this PED instance collective teams ride custom audio bicycle systems--6 wheeled, cart-pulling, built from salvaged bicycle parts, and powering hacked megaphones. Vehicles capable of large-scale public address. These human-driven machines broadcast audio via karaoke-inspired lectures, spreading information and entertainment in a new/ancient society. 3. The Vehicle for Ten Thousand Fertile Scholars’ Star Rated Market Approved Big Shiny Hot Pot for the Benevolent Ghosts from the Immortal Mountains of the Healthy Valley of Plenty. PED.Chongqingwas completed by an expanded PED team, including Warren Quigley and 38 students of the Sichuan Fine Arts Institute, Chongqing, China. It was realized in cooperation with the Chongqing 955 Bicycle Club and the International Long March project. PED.RIO (March 2007, Rio De Janiero, Brazil) Continuing to talk about global issues on a local level, PED.RIO seeks to distill issues of trade between the northern and southern hemispheres through the use of metaphor. Sugar, poetry, popular music, a dubious love duet and walkie-talkies are the tools used to guide the rider/transporter along the PED.RIO trade route. For the first time, PED is utilizing live voice transmission, layered on top of the pre-recorded soundtracks, to communicate with the riders. As a self-reflexive agency, PED acknowledges its complicity in the market of cultural exchange but sees invitations as opportunities to discuss and frame important global issues. Bicycles and walkie-talkies are considered low-tech technology at this point in history but continue to serve as common devices for urgent communication. Joan Linder and Warren Quigley became integral members of the PED team during the PED.RIO instance. PED.St.Johns (June 2008, St. Johns, Newfoundland) In this PED instance, stereo radio transmissions, each broadcast on a different frequency, engage riders who eavesdrop on a conversation between various characters (humans, non-humans, even phenomena) throughout the history of Newfoundland. This conversation is filled with misunderstandings, lost signals, faulty transmissions and disagreements across time. The shadow of Guglielmo Marconi’s historic lighthouse looms large. The persistent beeps of his morse code punctuate the dialog and the booming horns of freighters in the harbor periodically obliterate all narrative.